Hou la la, Capri is definitely made for me, I certainly have lived there in a previous life! I felt so comfortable, so happy and so reconnected with myself in a way that it is the only explanation I can come with... In addition with my adoration with Ancient Roman culture and a famous Tiberius... I am going to propose you from time to time, a culinary exploration of caprian pasta terribly good and very easy to realise, enjoyable by all the family! I begin with the most very simple dish, fresh and lovely as a starter for example... Only with pomodoro (tomatoes) and basilico (basil). You will see this yummy chiummenzana recipe absolutely everywhere in good restaurants and the best had been eaten at the Fontelina in front of the Faraglioni... This pasta was a match made in heaven for my son who is not keen at all on Mozzarella even though the Mozzarella di buffala direct from Napoli is definitely to die for ! With the freshest and finest ingredients, this pasta recipe can be a real gastro feast, la ricetta perfetta! 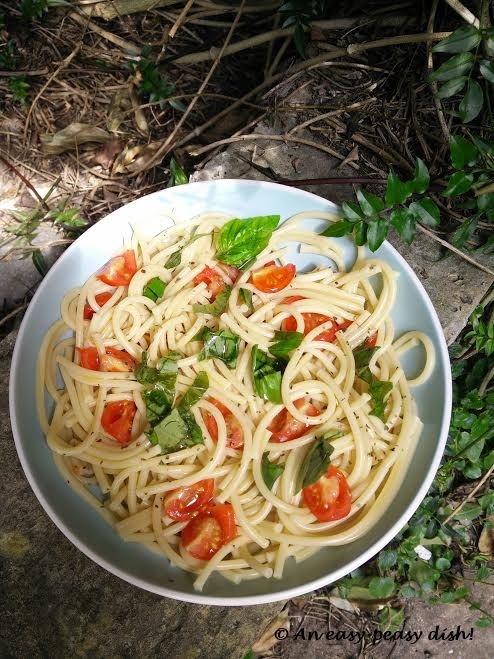 Nota : I advise you to use fresh pasta you can buy at the fresh department of your deli or supermarkets. First it is tastier and all my Italians friends are using them. Second, it cooks in 5 minutes only, impeccable for an easy-peasy dish! Wine pairing : Primitivo di Manduria (Red) from Puglia. In a large pan, soften the garlic in a little bit of olive oil. Add the tomatoes and let them cook for 20 minutes over a low heat. Meanwhile, cook the Bucatini in a large saucepan of boiling water for 6 minutes. Once the pasta cooked, drain and dispose them, with a few spoons of cooking water, in the pan with the tomatoes mixture. Serve with oregano and Parmesan. * if you cannot find fresh pasta, use normal one but adjust the time of cooking! Dans une large poêle, faites revenir l’ail dans un petit peu d’huile d’olive. Ajoutez les tomates et laissez cuire 20 minutes à feu doux en remuant de temps en temps. Dans une grande casserole, cuire dans l’eau bouillante les Bucatini pendant 6 minutes. Une fois cuites, les égoutter puis les déposer avec quelques cuillerées d’eau de cuisson dans la poêle contenant les tomates. Assaisonnez d’huile d’olive et bien mélanger le tout. Servir avec du parmesan fraichement râpé et saupoudrez d’origan.